To order online with a credit card or a PayPal account, select the appropriate amount to load onto the card (or cards) under the drop-down menu below (you will be able to select the quantity of cards at a later step) and enter any messages to the recipient or to us. Then, click on the "Buy Now" button; you'll be redirected to the secure PayPal site to enter log-in or credit card information. No PayPal account is required; you may use Visa, MasterCard, Discover, American Express, or a PayPal account. We can send your card to the recipient and address of your choosing: when checking out, simply un-check the "Ship to billing address" box and enter the recipient's name and address. Your card will be mailed via USPS, and will typically ship out within 24 hours. 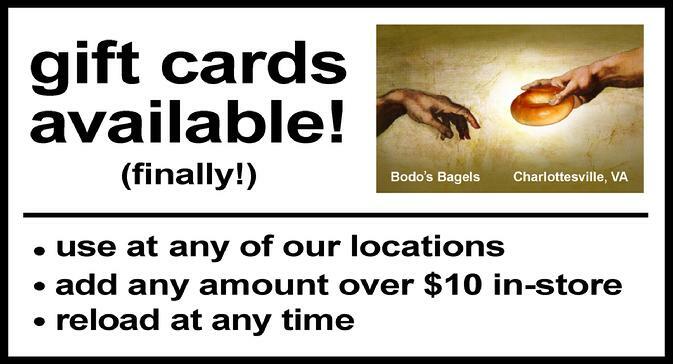 We follow up with an email when we receive your order; if you don't receive one within 48 hours, drop us an email (at bodosbagels@gmail.com, or see Contact Us page) to make sure that the order is being processed, as sometimes we don't get the requisite email from PayPal regarding payment. PayPal has added some feature options to the checkout procedure; hopefully we've made things easier for everyone. Thanks!